HostForLIFE.eu, the premier European Windows and ASP.NET provider proudly announces the immediate availability of Microsoft’s new SharePoint 2013 hosting. HostForLIFE.eu offers this new product at the amazing price, just only €9.99/month. HostForLIFE.eu utilizes the newly-released Microsoft Windows Server 2012 and SQL Server 2012 as the foundation for the plans. The base hosting plans specification have been architected to meet Microsoft recommended configurations for both SharePoint 2013 and SQL Server 2012 and will include SQL Server and disk configuration best practices identified by HostForLife’s database administrators to optimize SharePoint 2013 performance. The HostForLIFE.eu SharePoint 2013 product is divided into SharePoint Foundation 2013 and SharePoint Server 2013 hosting plan. SharePoint 2013 Foundation is the core platform of the product which comes with enhancements to the administration and user experience, plus new options for enterprise users to collaborate using social media features. SharePoint Server 2013 is basically Foundation with additional Enterprise services and functionality added on top. You will still get Central administration, basic search, document collaboration, and team sites with Foundation. For additional information about SharePoint 2013 offered by HostForLIFE.eu, please visit http://www.hostforlife.eu. HostForLIFE.eu is awarded Top No#1 SPOTLIGHT Recommended Hosting Partner by Microsoft (see www.microsoft.com/web/hosting/HostingProvider/Details/953). Our service is ranked the highest top #1 spot in several European countries, such as: Germany, Italy, Netherlands, France, Belgium, United Kingdom, Sweden, Finland, Switzerland and other European countries. Besides this award, we have also won several awards from reputable organizations in the hosting industry and the detail can be found on our official website. ASP.NET MVC 4 Developer Preview is out and has some nifty new mobile features that will allow you to target mobile devices. The new “Display Modes” feature lets an application render a specific view based on the device making the request. A desktop browser accessing a page might cause Index.cshtml to be rendered, but if the request comes from an iPad or an Andriod phone, Index.mobile.cshtml may be rendered. This convention-based approach lets you tailor your views without requiring any code changes. This will register a mode specifically for iPhones, and allow you to create view pages with “iPhone” as a suffix, such as MyView.iPhone.cshtml. See the release notes for additional details. You may begin to add some mobile views to your application, only to realize that you actually need to customize more than just the way your views are rendered. Maybe you need to add or remove some of the data your page is querying or do something different altogether. I recently created a mobile version of this blog and couldn’t just use home controller action as-is. I wanted my mobile view to list a summary of all of my blog posts, rather than the full content of just the first 3 posts, which is what you see in a desktop browser. Simply call HttpContext.GetOverridenBrowser() to get access to the browser capabilities and you can determine whether it’s mobile, and act accordingly. This method is an extension method in the System.Web.WebPages assembly, so don’t forget to add a using statement for this namespace! Detecting a mobile device like this isn’t new, of course. The first version of ASP.NET MVC allowed you to inspect the attributes of the requesting user-agent and chose the proper view to render. The downside of this is that there was no out-of-the-box way for a user to override this. Ever visit a site with your mobile phone and be presented with a stripped down view when you desperately wanted to see the full desktop-browser version, but couldn’t? ASP.NET MVC 4’s mobile features aren’t all that exciting to tell you the truth. The only new features so far are just some helpers and tooling around a technique that’s been around forever. That said, it’s a great addition to the framework. What's really exciting is the things jQuery Mobile and HTML5 bring to the table, allowing you easily build slick UIs that will look great on a phone or tablet and rival a native application. For more on that, definitely check out the tutorial over on the ASP.NET website that will use these new MVC 4 features and jQuery Mobile. When you install ASP.NET MVC 4 for Visual Studio 2010, If you are already using 4.5 framework in your box then you might get some strange errors. 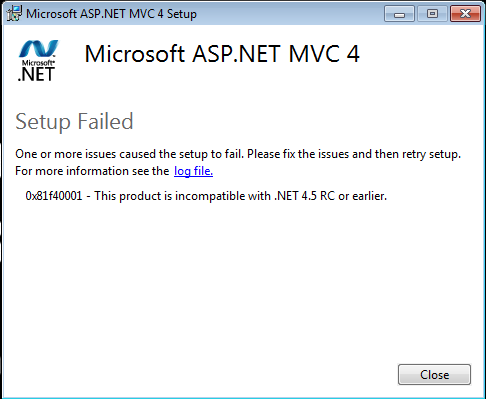 In this case I already having .NET Framework 4.5 RC and I want to install ASP.NET MVC 4 for Visual Studio 2010. Yes, you’ll see this strange error. The error said that Visual Studio 2010 needs .NET Framework 4.5. So, how to fix this error. To resolve this issue I removed the .NET Framework 4.5 RC from local box. And the second is uninstalling the .NET Framework 4.5 also removes pre-existing .NET Framework 4 files. If you want to go back to the .NET Framework 4, you must reinstall it and any updates to it. If you are not installing .NET Framework 4.0 after uninstallation of Framework 4.5 then you will get another error saying something like 'Framework 4.0 not found".